We’re featuring all of the gems used in our new collection on the blog to give you the story and inspiration behind our pieces, accompanied by original drawings from Jessica. Last week we did carnelian, next up is moonstone! 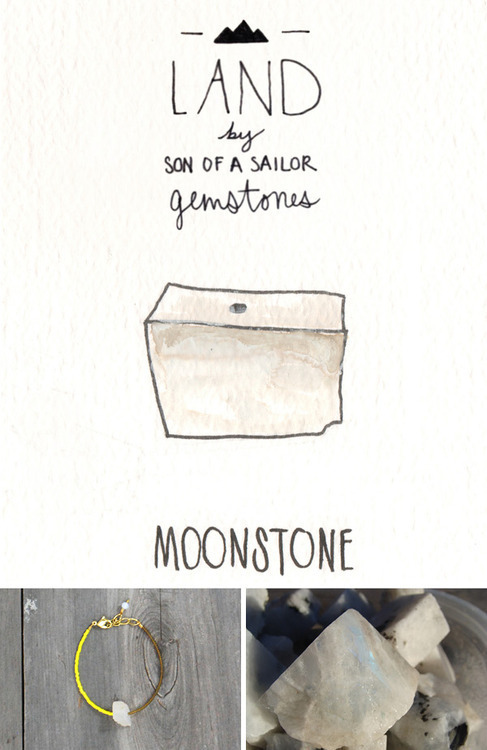 Moonstone just might be our favorite name for a gem - it sounds like it should be filled with mystical healing powers! 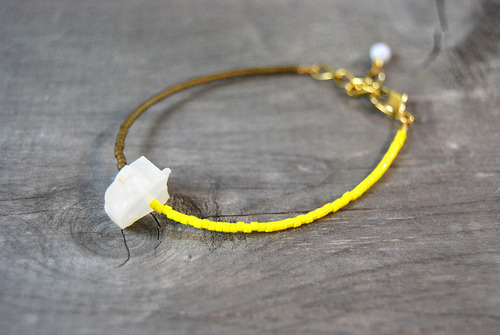 We use it for our Col bracelet, a bracelet featuring a rough cut moonstone surrounded by yellow and khaki Japanese glass beads. Here’s the science lesson: It’s a sodium potassium aluminium silicate, which means it’s a feldspar with a pearly, opalescent luster. 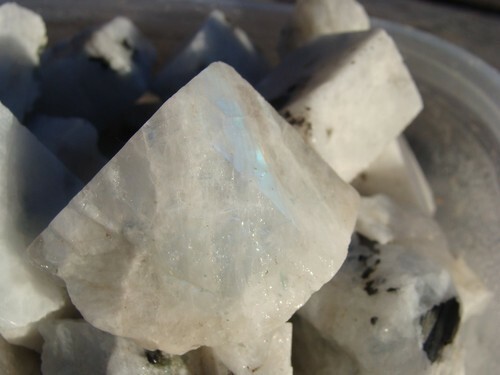 Moonstone’s formation process gives the gem a light defracting effect. Two feldspar species, orthoclase and albite, intermingle then, as they cool, the intergrowth of the minerals separates into layers. Light falls between these thing layers and scatters in many directions, creating an effect known as adularescence. Moonstone is known for its soothing qualities. Its light glow gives the stone a sense of serenity. Throughout history it’s been known as the stone of love, with the Romans and Greeks associating it with Moon gods and goddesses. It was mostly associated with Diana, the goddess of love, wealth, romance and fertility. We’re not guaranteeing our Col bracelet will find you eternal love buuut it certainly couldn’t hurt!